Ulm, Baden-Württemberg Death Metal band formed by guitarist Uli Hildenbrand, a member of infamous Black Metal band POISON, going under the title 'Angel Of Death' in that band. R.U. DEAD? came together in 1989 releasing the five track 'Simply Dead' demo the following year. 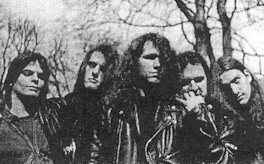 Promotion included live dates with NAPALM DEATH, PROTECTOR and ASPHYX. More demos followed in 1991 and and 1992. Tracks were lifted from the latter for a 7" EP on Morbid Records titled 'Hypnos'. However, guitarist Gero departed to join FLESHCRAWL and R.U. DEAD? split.